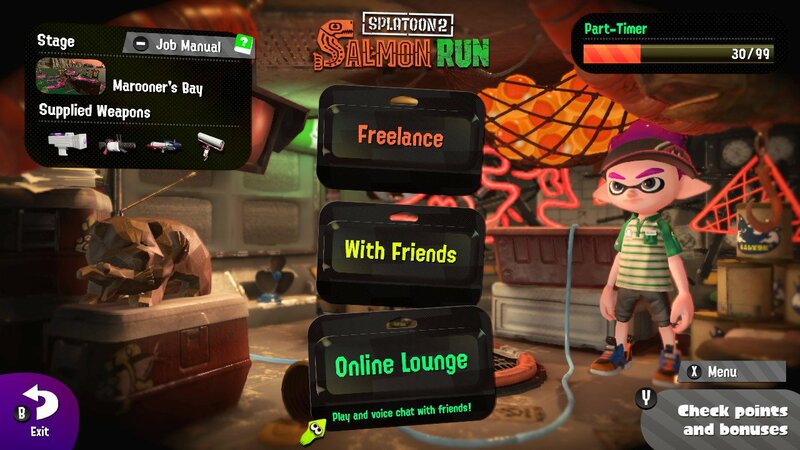 While the overall goal of Splatoon 2's co-op mode, Salmon Run, is fairly straightforward, the different permutations (i.e., local/adhoc network vs online), when you can play online, how you can connect with friends, and the rewards is a bit confusing. We've done our best to break this down and answer some of the more frequent questions about it. What modes support co-op in Splatoon 2? How many players can play Splatoon 2 via system link or LAN? How many players can play Splatoon 2 online? How many players are supported in combo co-op? What is the goal of Salmon Run? Kill bosses, get eggs; sounds easy! Where's the challenge? That's a lot to take in, can you summarize? How do I set up a match of Salmon Run with my friends? Is the Nintendo Switch Online app required? 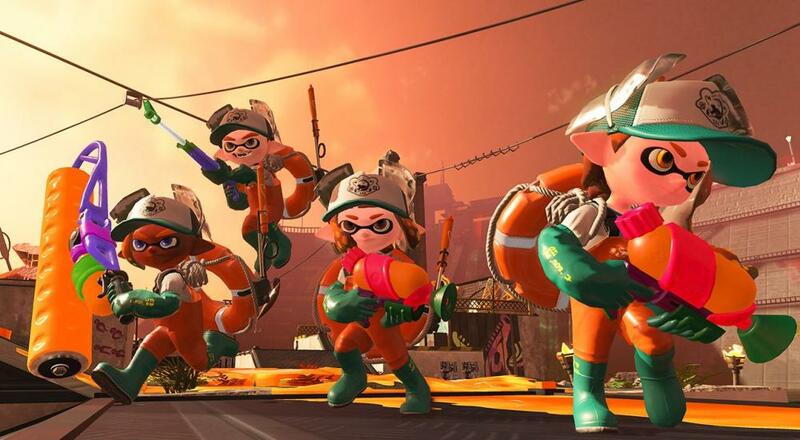 Are four players required to play Salmon Run? When playing online, can I join a friend's game if the host has a higher Pay Grade than me? While the multiplayer Turf War, Ranked Battle, and League Battle modes all support teams of players, none of those modes fit with Co-Optimus' definition of co-op. The only mode that supports co-op in Splatoon 2, per our definition, is Salmon Run. How many players can play Salmon Run via system link or LAN? Up to four players can play Salmon Run via a local wireless network, meaning each player needs their own Nintendo Switch and copy of Splatoon 2. How many players can play Salmon Run online? Up to four players can play online in Salmon Run. This version of the co-op mode is only available on certain days during certain times (usually a 24-hour period, such as 2:00 AM Wednesday to 2:00 AM Thursday) called "seasons." Once a season is over, the next one doesn't start until 18 hours later. 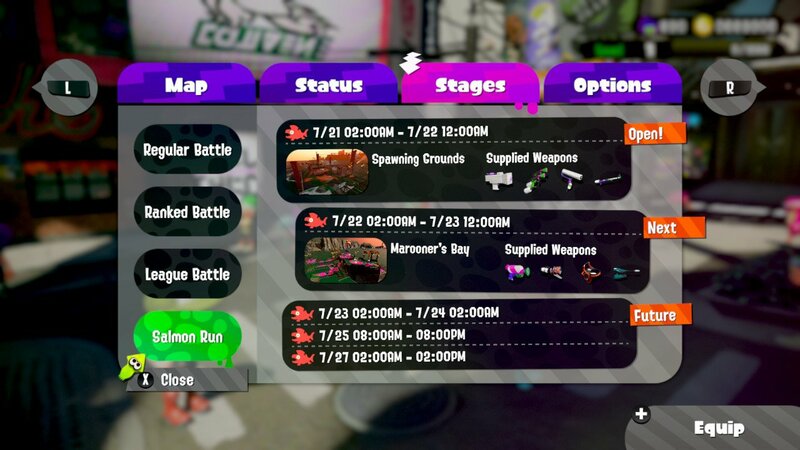 The schedule can be checked in the game from Inkopolis Square by pressing the "X" button, switching to the "Stages" tab, and then going down to "Salmon Run." Combo co-op is not supported. The primary objective of Salmon Run is to gather Golden Eggs from bosses and deposit them in the Egg Basket before the time runs out or the entire team is defeated. Salmon Run is divided into three rounds and each round requires players to collect a different number of Golden Eggs to meet the goal. Collecting more eggs than the specified amount will count as a bonus when calculating the rewards you earn after a match. There are a number of factors that affect the difficulty of Salmon Run. First is the overall difficulty level itself. For the online version this starts at 5% and increases based on your Pay Grade, which increases when you win matches and decreases when you lose. The higher the difficulty, the more enemies you'll face, including multiple bosses at once, along with more special waves, called "Known Occurrences." The latter throws some curve balls into the mix, such as the water in the level rising causing the overall map size to shrink or having to fend off frenzied enemies that all rush one member of your team. 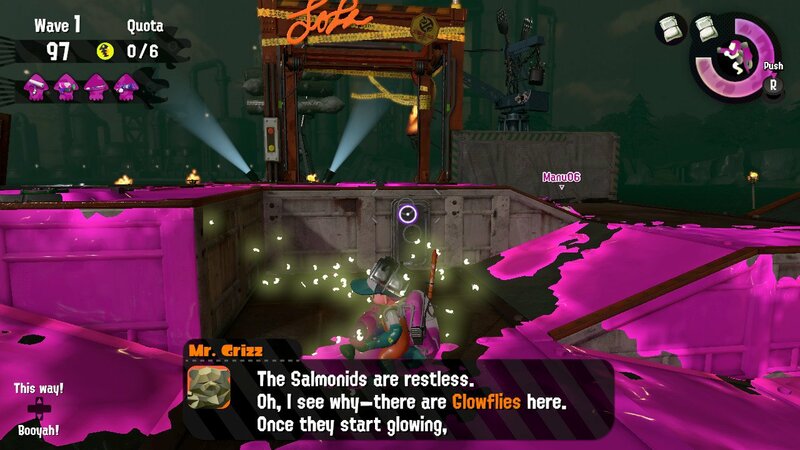 Second, your primary foes in Salmon Run are the Salmonids, which are divided into 4 "Lesser Salmonids" (enemies that can be defeated relatively quickly) and 10 "Boss Salmonids." The Boss Salmonids all require specific strategies to defeat, such as throwing splat bombs into specific locations on the boss or attacking certain weak spots to reveal additional areas to attack. Facing a single group of Lesser Salmonids and one Boss Salmonid is easy enough, but having to deal with multiple Boss Salmonids, each of whom has different attacks and require different strategies, ups the challenge and requires players to work together to prioritize certain enemies. Finally, the weapons players use for Salmon Run are changed every season and are a selection of 4 from the 9 available categories (Shooters, Blasters, Dualies, Rollers, Chargers, Brushes, Sloshers, Splatlings, and Brellas). Different weapons require players to take on different roles for the team. For instance, the Roller is great for inking the stage to allow teammates to get around faster as well as being an excellent way to take out Lesser Salmonid, but it's very poor at taking out certain bosses. Charger weapons are great against single-targets, such as bosses, but don't ink a lot of territory. Furthermore, players are assigned a different weapon every round, thus forcing players to change their "role." There are two key points about the rewards earned from Salmon Run. First, the rewards can only be used in the multiplayer modes (i.e., Turf War, Ranked Battles, and League Battles) as the gear you use in Salmon Run is set. 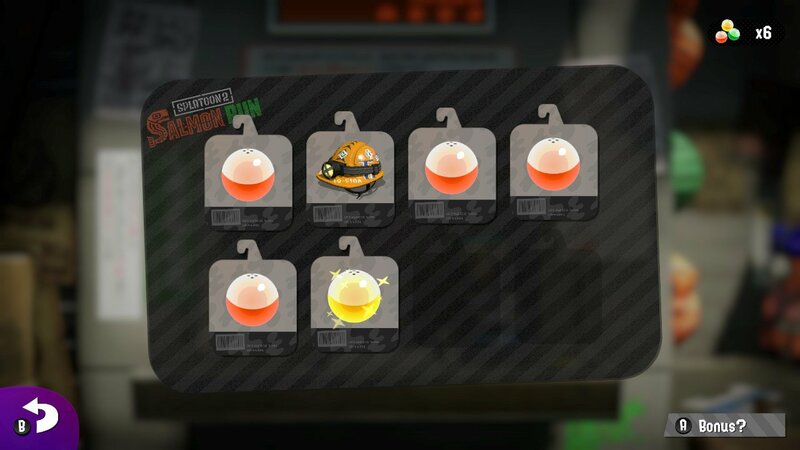 Second, rewards are different for the online version of Salmon Run than the local. The local version is, essentially, a custom match for friends. You can select the stage (at the moment, there are only two) and set the overall difficulty level. 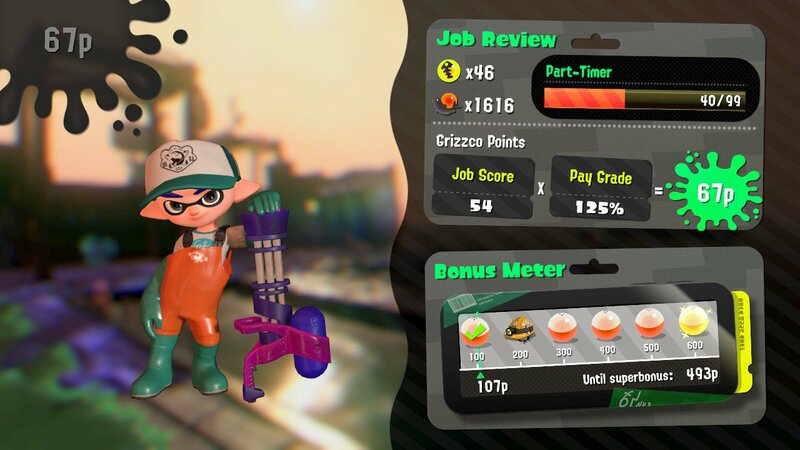 You will earn random rewards after acquiring a certain number of "Grizzco Points," which are given to players after a match based on the difficulty level, the number of additional Golden Eggs acquired during the match, and the total number of Power Eggs (dropped by Lesser Salmonids) gathered during the match. These rewards can include money (used to buy new head gear, shirts, shoes, and weapons for use in multiplayer), meal or drink tickets (provide experience and money buffs in multiplayer), or ability chunks (used to slot specific abilities into your gear). For the online version, rewards (i.e., money, meal/drink tickets, or ability chunks) are given out after every 100 Grizzco Points you earn. These points are calculated similar to the local version with the one difference being that a player's Pay Grade is used in place of the difficulty level. Your Pay Grade increases by 20 points for every successful match, and decreases by 20 points if you fail during the first round or 10 points if you fail during the second round. If you fail during the third round, your pay grade neither increases nor decreases. In addition to the money, ticket, and ability chunk prizes, the online version of Salmon Run also includes Daily Prizes that are awarded after every 600 Grizzco Points, and a monthly prize awarded at varying points levels. All of these prizes can be picked up from the Bonus Window located to the left of the Grizzco offices in Inkopolis Square after they are earned. Sure! Salmon Run is a four player "horde" mode that is split into three rounds. Each round tasks players with collecting eggs from bosses and bringing them back to a collection point. If players survive all three rounds, they'll earn rewards. Those rewards can only be used in the multiplayer modes. 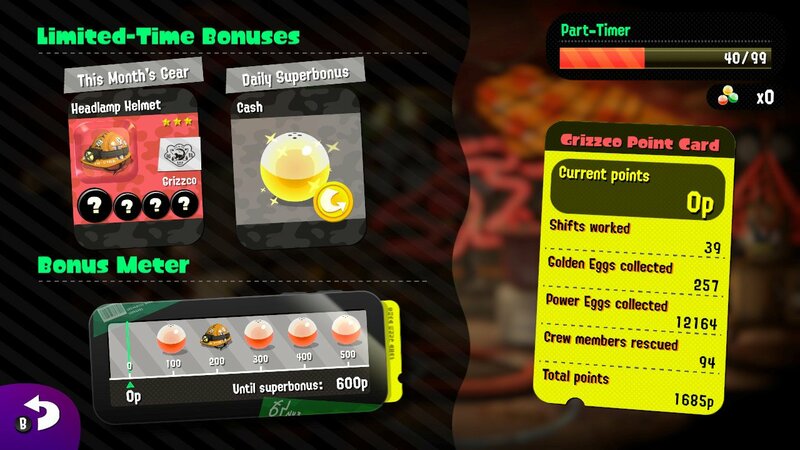 Additionally, the rewards you earn in the local version of the Salmon Run mode are different than the online version. Finally, the online version is only available during certain times. If you're playing locally, one person will act as the host and go to the Shoal area to create a Salmon Run room. Once the room is created, other nearby players can head to the Shoal as well and search for the room. The Nintendo Switch Online app is not required. If you wish to play the game online with friends, you'll first need to exchange Friend Codes with one another. Once that's done, one player will need to be the host and should go to Grizzco in Inkopolis Square, and then choose "Online Lounge" to create a room. A four-digit numeric password can be set to ensure only friends can join the room. Once the room is created, the other players can go to Grizzco and choose "With Friends," then choose the friend that is hosting and enter the password, if one was specified, to join the room. If you don't have a full crew of four, the host can open up the room to the public after friends have joined to fill in any additional spots. You can use the Nintendo Switch Online app to send and accept game invites to directly join a friend's room, as well as for online voice chat (assuming you have all the necessary cables/connectors), but it is not required in order to host a room and play with friends. No, two players is the minimum requirement to play Salmon Run. That said, the mode is geared in difficulty towards four players. Yes; there's a catch, though. 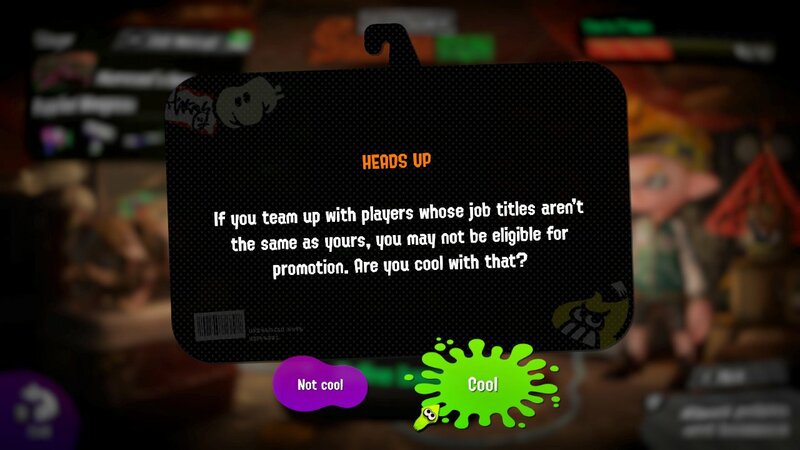 The overall difficulty of a Salmon Run match when playing with friends is determined by the player with the highest Pay Grade. That player cannot increase their Pay Grade until all other players are at the same Pay Grade as them, meaning any players of a lower Pay Grade have to catch up before that player can advanced. However, losing matches does cause all players to lose Pay Grade points. Page created in 1.2101 seconds.